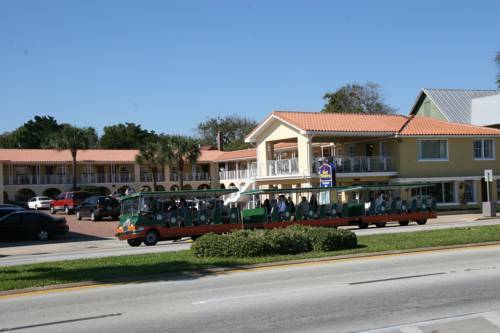 The Best Western Bayfront is located in the heart of the historic district on the beautiful Matanzas Bay. This 1950 historic hotel conversion has 59 comfortable, petite and cozy rooms while still offering all of our signature amenities and exceptional first in class service. The hotel is equipped to meet the expectations of our guests. Personal attention, friendly faces and a quaint family atmosphere is the foundation of what we strive to provide our guests. Having the ideal location within walking distance of all major attractions in the historical district, the Best Western Bayfront has much to offer. The Best Western Bayfront invites you to see the Spanish Quarter, a restored eighteenth century section of old St. Augustine. Here, Spanish soldiers and settlers lived with their families close to Spain's Florida fortress, the Castillo de San Marcos. Explore the Spanish Quarter and all of downtown St. Augustine, all within walking distance from your door step! We are convenient to the many sites, sounds and tastes of the nation's oldest city. For simple sightseeing we even offer sightseeing tickets and Old Town Trolley pickup right on site. In addition to telephones, wireless Internet access and cable television all rooms also contain refrigerators and microwaves for your convenience. While you are here, casually walk down narrow brick streets to quaint taverns, restaurants, shops and balconied Spanish homes. Watch the fishing fleet as it puts to sea each morning. The old fortress, Castillo de San Marcos National Monument, is virtually next door, as are tennis courts, an ice cream parlor, coffee shops, restaurants and historic attractions. Enjoy your stay. From: The north. Take I-95 South from Jacksonville to State Road 16 Exit 318. Go east on State Road 16 to St. Augustine US 1. Turn right on US 1 then turn left on Castillo Drive. Proceed down Castillo Drive until it ends at San Marco Avenue. Turn right on San Marco Avenue until it becomes Avenida Menendez Avenue along the bay front. The Best Western Bayfront is on the right side at 16 Avenida Menendez Avenue. From: The south. Take I-95 North from Daytona to State Road 16 Exit 318. Go east on State Road 16 to St. Augustine to US 1. Turn right on US 1 then turn left on Castillo Drive. Proceed down Castillo Drive until it ends at San Marco Avenue. Turn right on San Marco Avenue until it becomes Avenida Menendez Avenue along the bay front. The Best Western Bayfront is on the right side at 16 Avenida Menendez Avenue. ~51 miles from Saint Augustine.